Decentralized payout pooling solves the problem of centralized mining pools degrading the decentralization of Bitcoin and avoids the risk of hard to detect theft by pool operators. Miners are configured to connect to a P2Pool node that can be run locally, alongside the miner. P2Pool users must run a full Bitcoin node which serves the purpose of independently validating transactions and the Bitcoin blockchain. P2Pool also supports merged mining and several alternative blockchains. P2Pool nodes work on a chain of shares similar to Bitcoin's blockchain. Each node works on a block that includes payouts to the previous shares' owners and the node itself, which can also result in a share if it meets P2Pool's difficulty. Because of the importance of strengthening Bitcoin's decentralization, some Bitcoin supporters donate to P2Pool miners, resulting in average returns above 100% of the expected reward. However, it should be noted that there are other pools (such as BitPenny and Eligius) which can provide this same level of decentralization. P2Pool shares form a "sharechain" with each share referencing the previous share's hash. 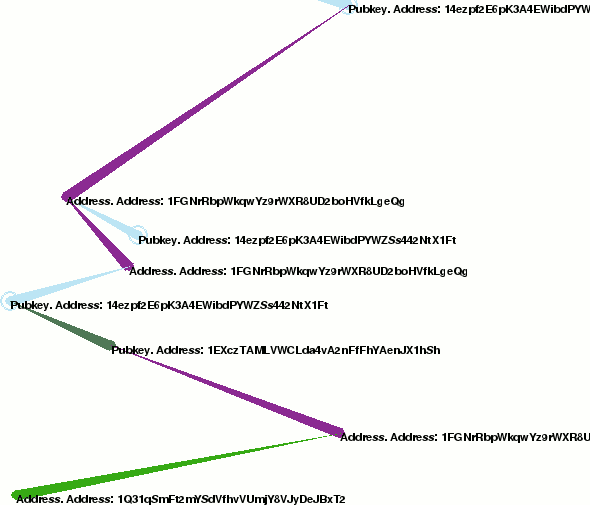 Each share contains a standard Bitcoin block header, some P2Pool-specific data that is used to compute the generation transaction (total subsidy, payout script of this share, a nonce, the previous share's hash, and the current target for shares), and a Merkle branch linking that generation transaction to the block header's Merkle hash. The chain continuously regulates its target to keep generation around one share every thirty seconds, just as Bitcoin regulates it to generate one block every ten minutes. This means that finding shares becomes more difficult (resulting in higher variance) the more people mine on P2Pool, though large miners have the option to raise their difficulty, and so reduce the impact of their mining on P2Pool's minimum difficulty. Each share contains a generation transaction that pays to the previous n shares, where n is the number of shares whose total work is equal to 3 times the average work required to solve a block, or 8640 (= 72 hours of shares), whichever is smaller. Payouts are weighted based on the amount of work each share took to solve, which is proportional to the p2pool difficulty at that time. A subsidy of 0.5% is sent to the node that solved the block in order to discourage not sharing solutions that qualify as a block. (A miner with the aim to harm others could withhold the block, thereby preventing anybody from getting paid. He can NOT redirect the payout to himself.) The remaining 99.5% is distributed evenly to miners based on work done recently. In the event that a share qualifies as a block, this generation transaction is exposed to the Bitcoin network and takes effect, transferring each node its payout. On P2Pool stales refer to shares which can't make it into the sharechain. Because the sharechain is 20 times faster than the Bitcoin chain many stales are common and expected. However, because the payout is PPLNS only your stale rate relative to other nodes is relevant; the absolute rate is not. There are two reported kinds of stales in P2Pool: "DEAD ON ARRIVAL" shares and orphan shares. Dead shares were too old by the time they arrived at your local P2Pool. Very high dead rates can indicate miner misconfiguration. Orphan shares are shares which were not extended by the rest of the P2Pool network, because some other miner's share was accepted first. Very high orphan rates may indicate network connectivity problems. When you first start P2Pool claimed efficiency will be low and the error bounds on this estimate will be large, but as it runs the numbers will converge to their correct values. If your efficiency is unusually low, make sure your network connection isn't overloaded, that your miners support long polling and are not set to work for excessive amounts of time, and that your bitcoind has multiple connections. Replace LONG_RANDOM_SECRET_VALUE with something long and random like the output of smashing your keyboard for a bit like fju4M78yAj3ds39pak92raK. You don't need to be able to remember it. If your RPC port becomes exposed to the internet a thief could steal your bitcoin if they could guess it, or use a brute force attack in order to find it. Q: "Why does my miner report so many longpoll events when mining on p2pool? - P4Man"
A: "Once every ~30 seconds is normal. That is how often p2pool shares are generated (as opposed to ~10 min for bitcoin blocks) - cabin"
Q: "Do the 'orphan' and 'dead' shares in P2Pool's status display hurt me?" A: They shouldn't - It's normal for some fraction of everyone's shares to end up orphaned or dead. Because payouts are calculated by counting how many shares you have relative to others, everyone with normal configurations is equally "hurt" by this. However, if you have a large proportion of stales, your payout will be hurt. You can see how well you're doing by looking at P2Pool's "Efficiency" (ex: Efficiency: ~110.6% (40-111%)). If 100% doesn't lie within the confidence interval at the end, something is probably wrong (with 95% confidence). Q: "What do I do if my efficiency is low?" A: Make sure the computers you're running P2Pool and the miner on have enough memory and CPU time. If you have a lot of dead shares or the "Local dead on arrival" number is higher than a few percent, that means that something is wrong with your miner. Check to make sure that it is one of the working versions in the Miners section on this page. Lower the intensity or raise the FPS of your miner. If you have a lot of orphan shares, something is wrong with P2Pool's P2P connection. Decrease the load on your internet connection or enable QoS (Quality of Service) on your router. A: Pay-Per-Last-N-Shares is a payout method that is completely resistant to pool hoppers. Q: Why am I not getting very many shares?! A: The P2Pool difficulty is hundreds of times higher than on other pools. It can take time to get a share. P2Pool displays an estimate of how long you have to wait in the console output. Q: Why does my miner say it has found a lot of shares but p2pool say I have only found a few?! Q: Why am I getting so many rejects? A: You're using an incompatible miner. See the miners section here, increase your FPS on the miner, decrease the intensity, upgrade your miner, or try a different miner. Q: What stops the pool operator or the block finder from stealing a block? A: A block solution is only worth anything because its hash matches Bitcoin's target. Altering anything within the block will change its hash and make it worthless. If you are concerned about the pool operator stealing a block, you should try to inspect the source code of each new version. Q: Why does it say "Generated?" I want to spend my coins now! A: P2Pool includes payouts in generation transactions, which must mature (taking 120 blocks or 20 hours) before they can be spent. The reason for this is that a block could be orphaned, which would make its payout invalid and could reverse transactions. Q: Do I get paid transaction fees? A: Yes. They are split among P2Pool miners. Q: What are these payments I'm getting that aren't generated? A: These are subsidies that people who support the idea of P2Pool send to miners. Q: Cool Subsidies sound like an awesome idea! How do I send some BTC to these awesome miners? A: See end of this page. Q: Do I really need the WHOLE blockchain? A: Yes. Your node needs to be able to independently make decisions about what transactions to mine. Q: How do merged mining payments work? A: Merged mining is handled entirely by namecoind, so you're solo mining and payouts will go into namecoind's wallet. This is all for the latest p2pool version, as it includes several new workarounds. With all miners, using a HIGH FPS target (100?) or a LOW intensity (8 for bfgminer?) helps a lot with reducing stales. bfgminer, cgminer, and ufasoft work perfectly without any extra options. DiabloMiner works fine after commit 3b731b9. Phoenix works fine after commit a658ef2. Poclbm works fine after commit 5e994e7. P2Pool uses higher difficulty shares than most centralized pools, so you'll see fewer shares reported. This is normal and doesn't reduce your payments. It's also normal to see longpoll messages once per every ten seconds on average. Because of fast longpooling in p2pool it is better not NOT fetch work ahead. On non-dedicated machines intensity=3 allows normal usage of PC, set it to 7 or more to get full hashrate. On most cards best is diablo and phatk kernel, looks like poclbm kernel have unstable rate. If upgrading P2Pool or changing its configuration, you can start another instance of P2Pool in parallel with the first. It will start normally, but realize that the worker and P2P listening ports are busy and keep trying to bind to them in the background. Thus, you can do almost-completely-seamless upgrades of P2Pool. If you run multiple P2Pool nodes or have trusted friends that run P2Pool, you can use -n to establish a constant extra P2P connection to them. Appending "/1000" to a miner's username will increase the difficulty of producing a P2Pool share to at most 1000. This is useful to large miners because doing this can make it easier for small miners while minimally impacting the large miners themselves. See recommended values. /static/ - Lots of information from shares to graphs to payouts. P2pool works fine with most hardware. This lists some of the hardware confirmed to work and any special configuration required. This is a list of hardware with known issues that should not be used on p2pool. This project was announced on June 17, 2011 by Forrest Voight. The pool began testing against mainnet in mid-July, 2011. The pool was reviewed on a Bitcoin Miner post on July 26, 2011. The software author's address for donations can be found in the signature section of his forum profile. ~/src/bitcoin/src/bitcoind sendmany "" "$(GET http://127.0.0.1:9332/patron_sendmany/10)"
You can replace "" with "accountname" if you want to pay from some specific bitcoind account, and you need to replace 127.0.0.1 with the address of your P2Pool node if you're not running one locally. Note that the amount you donate will be allocated to recent miners in proportion to the amount of work they've done in the last 24 hours or so, but all the miner whose shares of the donated amount are less than 0.01 BTC will have their shares combined into a single amount which is awarded to one of them at random, with the chance of winning this 'lottery' weighted by the miner's recent amount of work done. You can change this 0.01 BTC threshold like this, for example, which says to pay 10 BTC, but to share it amongst more miners that the default, cutting off at 0.001 BTC instead of at 0.01 BTC. ~/src/bitcoin/src/bitcoind sendmany "" "$(GET http://127.0.0.1:9332/patron_sendmany/10/0.001)"
If you decide to donate you should announce it on the forums so that your donations provide the most incentive possible. The existing p2pool has issues with dust. As more miners join the pool each individual miners payout becomes smaller, so eventually the cost to spend such outputs become significant. Lightning p2pool is an idea which would result in p2pool share payouts being sent over payment channels. poolnode.info Public list of P2Pool BTC/LTC nodes. whatisp2pool.com An easy introduction to mining and P2Pool. ↑ p2pool: Decentralized, DoS-resistant, Hop-Proof - Now active on mainnet! ↑ Lightning’s Next Act: Decentralizing Bitcoin Mining?